At some point in your life, someone has said to you “Tell me something interesting.” I say that often to my 11 year old son, partially for my own entertainment and partially because I am intrigued by what he finds interesting. But I often think about what actually makes something interesting. And I think what makes something interesting is the same for most people. It’s detail and specificity communicated (somewhat) well. So let me tell you something interesting about our brewery’s name. In my late 20s, I was in need of a thrilling extracurricular activity. I wasn’t in the position to get a sports car or quit my job to roam the earth. But I knew some people who were into rock climbing, and I had even done some of this in my youth, so it wasn’t unfamiliar. I decided to pick it up again and subsequently dove in 100%. Ropes, harnesses, and carabiners were acquired in earnest, and I tackled indoor gym climbing during the week so I could crush real cliffs on the weekends. Epic trips were made to NY and WV, but the most fun was had at a relatively local Pennsylvania crag. Autumn Arch is the name of a climbing spot in central Pennsylvania that my brother and I frequented. As I got into outdoor rock climbing, I would often ask Dann to come along. He spent a lot of his youth climbing boulders and was already really strong, so he made a good partner. Climbing seems like it’s a constant thrill ride, but let me disabuse you of that notion - a lot of climbing is preparing equipment, belaying, and setting anchors, something Alex Honnold doesn’t really do, and those things take time to do well. So there’s a decent amount of hanging around, talking, and catching up - and that’s just as much part of the climbing experience as scaling the insanely steep cliffs. Climbing on Saturday mornings is how Dann and I bonded as adults. Autumn Arch is the connection to great beer because it was the prelude to us home brewing together. For example, take the standard IPA. We started out with a malty, amber colored IPA with relatively mild bitterness and it would have been described by the casual observer as “thin” or “meh”. By modifying the grain bill (eliminating stupid crystal malts, adding some pilsner and flaked oats), adjusting mash temperature down a few degrees (a few degrees makes a big difference), and being more selective with our hop additions, we arrived at a nicely hopped, bitter as hell, bone-dry, resinous IPA. There was a lot of experimentation in between those two points. And that’s the essence of the “Beer Project”. Constant experimentation to achieve perfection. And lastly, we like to think Autumn Arch Beer Project is a beautiful name. So that tied the knot for us. We were married to it and onward we march to brewing great beer in Delaware. There it is. The good and interesting stuff is in the details. Dann and I did a small tasting event at How Do You Brew in Newark last week, and to prepare, I dug into our cellar and pulled out a couple sour beers that we made back in 2017. They were still in their carboys, yeast and all. I tasted two (of the 8) and picked the more interesting of the pair and kegged it a few days prior so that it was properly carbonated. 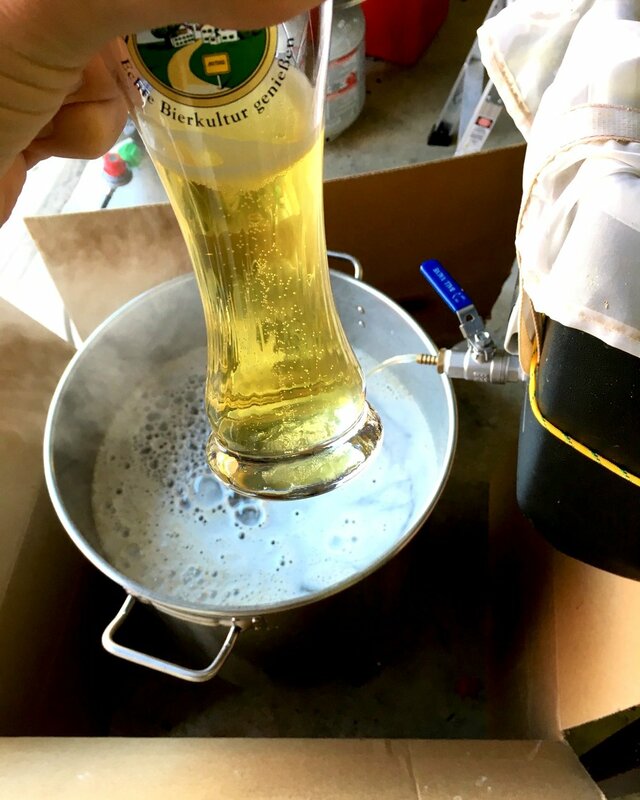 As I was waiting for beer to transfer from carboy to keg (auto-siphon = slow), I was thinking back on all the brew days that went into making the beer we had in storage. There were a lot of great times hanging out in the garage, sharing epic beers, shooting the breeze with Dann, and keeping the dog away from the spent grain. Brewing beer at home is quite an amazing little hobby. And it’s quite an American hobby too. The founding fathers really wanted America to produce badass wines like France and Spain. But this was not the fate of the New World. Jefferson and Washington both had grand plans for their vineyards, but this little guy continually thwarted all attempts at planting European grapes (and native American grapes make absolutely terrible wine). Phylloxera nymphs basically feed on the roots of grape vines eventually killing it. So even though the mid-Atlantic climate is decent for growing grapes, it just wasn’t an option. And I’d like to think this is how America got off to such a good start. We were destined to be a beer producing country. And that’s about American as you can get. Then you need to find a badass winemaker (which could be you if fortunate enough to have grown up on said wine estate and had years of free training in the art), and these folks are rare because of the above point of wine making being expensive. It’s not something you get into easily like riding a bike or rooting for the Eagles, thus, there is a small pool of quality wine makers in the world (relative to say accountants or mechanics). And then your wine is subject to the variability of the raw materials - the grapes! And there’s a lot of variability in grapes. In fact, this variability is so high from field to field that wine producers have coined a fancy term for this - terrior (pronouced terr a wah….French of course) and made it a selling point! Clever bastards! And this is where a quality winemaker makes his or her bones - turning relatively poor grapes, with non-ideal terrior, into a decent wine is hard. Deep knowledge and experience is required to do this consistently. And that’s all I can say about it because I don’t know how they do it (but if you’ve had a great dry wine made with grapes from DE or PA, I assure you that there was an amazing winemaker behind it). Wine = hard. Man and Nature are working against you succeeding in this endeavor. Enter beer making. The largest raw material component, grain, is cheap, and relatively homogeneous (low variability) because it’s grown over massive areas of the US and Canada and sold in bulk. And unlike grapes, grain can be stored for years. Hops are fairly easy to grow as well (I have eight hop vines thriving in my backyard...coming to an Autumn Arch beer in August!). The stainless equipment is still pricey, but the overall cost to start producing beer on a large scale is a fraction of producing wine. And it’s quite cheap to do at home, especially considering the high quality results an enthusiast novice brewer can achieve (I am not counting the time investment since its a hobby, and thus should not be monetized when trying to make a point about beer making). We live in an egalitarian county, and I would hypothesize that beer is the egalitarian beverage. So put down that wine glass, find a buddy to share the experience, pick up the supplies at your local homebrew shop, and create your own American beer! Being in an industrial complex, there was the potential to have a lot unpleasant smells lingering in the air, but fortunately, we only have to deal with the ones associated with chocolate chip cookies and beer. And I must say, the tables are looking particularly badass. The assembly actually turned out to be one of those projects that is mildly difficult, but nothing insurmountable comes up, and everyone ends up having a good time joking around and getting it done. Zero trips to Home Depot also contributed to the overall level of fun. And in the end, there was an enormous cooler to gaze upon - a monument to our hard work and future cold beer. The real question any brewery should be asking is this - who’s your customer and why are they going to buy your product over some other brewery? After all, there are quite a few breweries making fine libations without us in the mix.